Earlier today I noticed a post on ComingSoon mentioning that an ad for the District 9 viral had started appearing on bus stop benches, but I didn't think much about. Wen I was out driving today, I passed a few of them, so I decided to stop by one and take a few shots of it (while getting some odd looks). The ad, as you can see below, plays on the non-human segregation idea again, stating that the bus stop is for humans only. 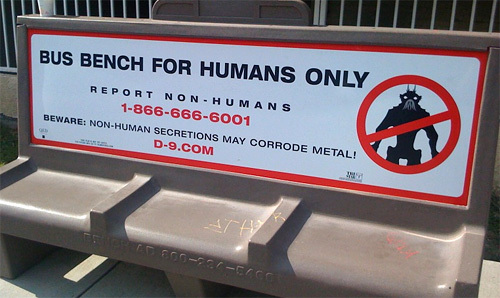 And there's the quirky line beneath it that says: "Beware non-human secretions may corrode metal!" The phone number actually connects with the corporation Multi-National United and it links to D-9.com. The unfortunate thing is that, despite all of this new advertising, the viral hasn't changed. All of the ads point to the D-9.com website, but that website hasn't changed since it launched last year. The only difference is that the teaser trailer pops up first before users can continue on into the site. I would hope that they would've added something new since it launched last year or would've moved the whole viral into its "next phase," since the movie is due out in less than three months, but nothing has happened. As far as I know, there aren't any major updates yet. Maybe we'll see something soon, hopefully? We'll let you know! Well that line about their secretions corroding metal is a small little bit of news. Is it possible they use it as a weapon? Defense mechanism? yeah, i've followed the site and very little has changed on it in the last year... makes me sad. cause its a cool site too. It happens alot in the viral blog..
Did anybody else call the number..I did and it gave you a new website. It says 1 to report a non-human that escaped from district 9. Press 2 to look into careers for humans and non-humans. To find out more about MNU go to http://www.multinationalunited.com So there IS a new website. :-p I haven't gone to it yet. I typed that as I was listening to the phone message...I didn't dare press "0" to talk to a representative. lol. I was afraid someone would actually be on the line..lol.. Cause it says press "0" btw to talk to someone. I might call back and press 0 though. I have to admit I haven't been this excited for a movie since Cloverfield. Although I was DEEP into cloverfield even from Literally Day one July 4th 2007. lol. I typed it wrong..it's http://www.multinationalunited.com/ and OH MAN. ITS SO CREEPY...THAT WEBSITE IS DEFINTELY BOSS. 4- 14 1989 is the day it says the aliens landed in South AFrica on the MNU website..geez. I could do this all day..lol. MNU used to be called Henderson Manufacturing 6- 15- 1982. This is all under PAST at the MNU website. starting to have this premonition that D9s gonna be a Huge Let down but I'M still looking forward for Transformers 2 funny people Sherlock Holmes ( well for some reason aka martial art expert holmes) Bruno The Wolf Man !!!! (benicio de wolfro) Avatar by the way, ice age 3 suppose to come out in a month but i havnt seen much advertising or anything really.... hope it int like shrek 3 .. If you go to the Math's for outer Space website http://www.mathsfromouterspace.com/ you can take a tests and it mentions on the main page something about scrambling DNA w/ Non-humans. It did let me copy and paste it..as seen below. Become a learning pioneer! Maths From Outer Space wants to redefine what it means to be human! Our scientists have found a way to enhance the spatial and logic capabilities of the human body. By synthesizing earth-based proteins with DNA from our other-worldly friends, the MFOS program will enhance your natural physical and mental capabilities. In other words, we've found a way to make you smarter! Would you like to see if you are qualified to take part in this exciting endeavor? So I took the test, but I zoomed past the last few questions so I got. Sorry, you answered 4/10 correctly. It appears that you are below our baseline standards for this program. However, you may qualify for other MNU initiatives. Please register below for more details. I'm going to copy and paste the last four questions and see if I can find a answer online. I think if I get them all right I might get somewhere. Jaybear - If you read some of our older District 9 updates, all of this has been solved. These sites have ALL been around since last year. But there haven't been any major updates for a while. The only site that has updates is George's blog - http://www.mnuspreadslies.com/. That's where the trailer without the blur on the face of the alien first showed up. This was a very long movie that I was not very impressed with. I thought that the concept was good but the overall movie could have been a little better.